The Template is the pre-built structure for your page. For different pages, you have the options to select the Template which best suits your page to manage in a specific way. 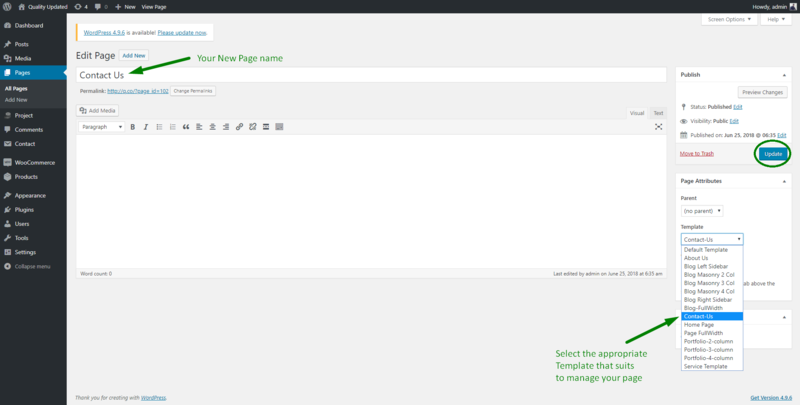 Just you need to select the Template & assign it to your page. Here Template Settings enable you to configure your templates. It has various sections related to Templates, Archive pages, Google Map, Contact details and Portfolio slug. For Blog, we have considered all Blog related templates, Contact-Us template, Service Template, editing title for the pages like Archive, Category, Author, Tag, Search, 404, Project categories and Shop. Your Page with “About Us” template will show up in three section. You can hide or show any section from the page though About Us page settings. Your Service page having the “Service Template” will show up in three sections. You can hide or show any section from the page though Service page settings. From here you can change the Slug for Project Category. After changing, if you don’t notice any changes in URL slug, then try to save WordPress permalinks again. Please note Slug change is not applicable for “Plain Permalinks”. For more clear understanding you can see the GIF screenshot. Here you can change the title of Archive Pages (Page have posts based on certain criteria). Archive Page could be based on certain Date, Author, Category, Search, 404, Project categories, Shop or Tag. For every Archive page, there is an available option field to change the title in Archive page title settings. From here you can save your Contact details. These Contact details will be shown up on your contact page having “Contact-Us” template. Just need to fill up all the details in Contact page setting. Here you can save your Google Maps URL. 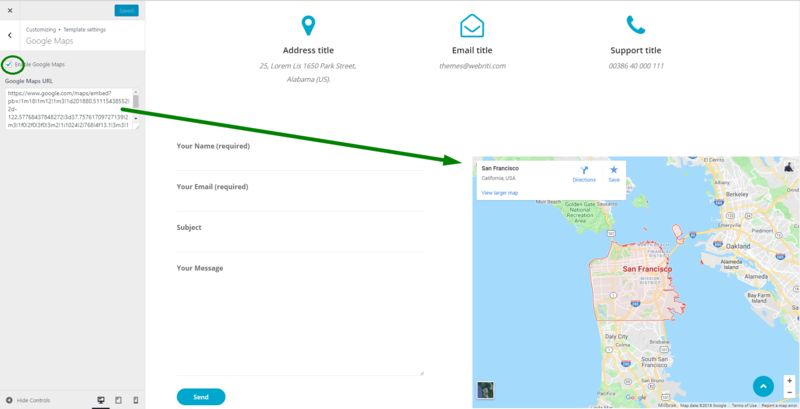 This saved Google Maps URL location will come to in display for your Contact Us page (Assigned with “Contact-Us “Template). You can disable this Google Map from Contact Us page to hide whenever you want. Enable Google Maps: To Show and Hide the Google Map from Contact Us page, just check and uncheck the checkbox respectively. Google Maps URL: Save the Google Map URL here to display your Google Map location on Contact Us page.